Leukocyte and platelet-rich fibrin (L-PRF), a second-generation platelet concentrate invented by Joseph Choukroun in 2001, has been the focus of intensive research endeavors over the past 2 decades. Over the years, numerous reports, including those published initially by Choukroun et al. from 2001 to 2006 as well as others, have in fact misrepresented g-force values. These values have since been re-transcribed in a number of studies moving forward by many authors causing considerable confusion in the field.,,, Unfortunately, various research groups have continued to inaccurately misrepresent g-forces, and this article aims to clarify these miscalculations. One of the confusions that has been created in the field over the years is that various authors have reported centrifugal g-force at the PRF clot (referred to as relative centrifugal force (RCF)-clot – location at which the PRF clot is formed), whereas others have utilized the international standard method to report g-force calculated at the bottom of centrifugation tubes (RCF-max). Furthermore, initial studies published by Choukroun et al. and Dohan et al. in 2006 reported RCF-min values calculated at the upper portion of PRF tubes [Table 1]. This has caused considerable confusion for the readers since the majority of these studies have also not reported the location at which g-force values were actually calculated. In this article, we highlight how “RCF-clot” is not only a deviation from the standard method used to report g-force at the bottom of centrifugation tubes [Figure 1] but also one subject to significant error and variation owing to centrifugation time, patient hematocrit levels, initial volume of blood collected, and other factors. For these reasons and those further reported throughout this article, we propose that a consensus be reached to standardize g-force values based on international centrifugation guidelines that have been referenced at the bottom of the centrifugation tubes (RCF-max) [Figure 1]. Although the g-forces applied throughout the centrifugation tube vary significantly as a result of tube angulation, rotor size, and/or bucket sizes/types, we demonstrate through several illustrations and photos the inability to accurately report g-force values at the RCF-clot. We further show how recent work by Cortellini et al. 2018 has in fact incorrectly reported g-force at the clot (RCF-clot). This article aims to clarify these misunderstandings and proposes that a consensus be reached regarding more accurate means to report g-force values in future studies investigating PRF. One of the areas that has led to great confusion over the years is that RCF values have been calculated at various regions along a centrifugation tube. For these reasons, it is important to have a basic understanding of RCF values including calculations to obtain RCF-min, RCF-max, and RCF-av. The formula for RCF is as follows: RCF = 11.18 x r x (N/1000)2 where N is revolutions per minute and r is the radius in mm. Therefore, the radius plays a multiplying role on the relative centrifugal g-force. As the radius is increased, g-force values are exponentially larger. 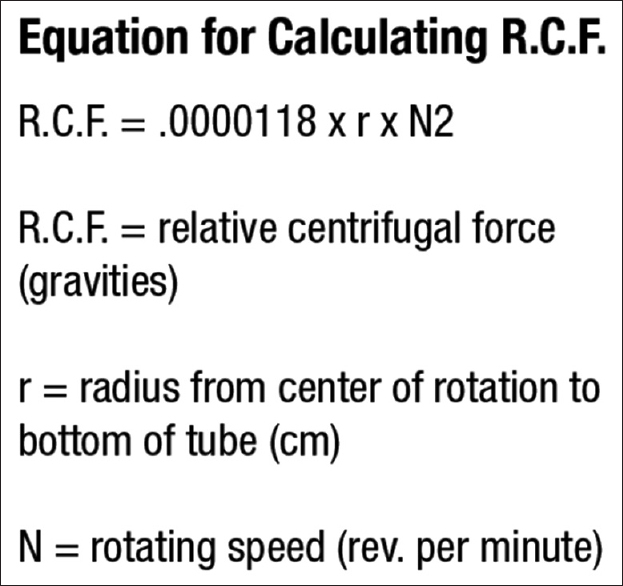 As shown in [Figure 2]a, representing a centrifuge (which typically range in angulation from 30 to 45 degrees), RCF values can easily be doubled between the RCF-min and RCF-max based on this increased radius distance [Table 1]. RCF-av represents the average g-force throughout an entire centrifugation tube. One of the confusions that has been created and expressed later in this article is that many articles related to PRF have often utilized RCF-min or RCF-max values without reporting exactly where the RCF values were calculated. This has caused significant difficulty for researchers to further reproduce data, and a general lack of understanding has been created as a result. To further complicate these matters, RCF-clot calculations were also introduced in the late 2000s which further confused many readers since these g-force values were never transparently provided by authors [Figure 2]b. For reasons later expressed in this article, RCF-clot has several drawbacks and limitations with inaccuracies in RCF calculations reported in the literature since the exact location of the clot can never be standardized at the same location, especially when liquid PRF versus PRF clots are created. While internationally, the standard method to report g-forces are calculated at the RCF-max, below we demonstrate many deviations from these standard methods with respect to PRF articles over the years. Actually, neither of these two studies actually reported an RCF-clot value of 408 RCF, and we wish to clarify the reported g-forces in these initial L-PRF articles. The article by Dohan et al. 2006, actually reported a centrifugation speed and time of 3000RPM for 10 min in a PC-O2 centrifuge (This centrifuge is dimensionally the same as the current centrifugation system offered today by Intralock, USA). In this study by Dohan et al. 2006, a difference in both centrifugation time and RPMs from the described protocols utilized in studies by Pinto and Quirynen (2700RPM and 12 min). The referenced 400 g force was at the RCF-min and not the RCF-clot [Table 1]. Furthermore, while attempts to report original L-PRF RCF values were described at 408 g and cite accordingly the work by Choukroun et al. in 2006, it is of significance to note that this study actually reported a g-force value of 280 g (not ~400 g). In the study by Choukroun et al. 2006, a centrifugation time and speed was reported at 2500RPM for 10 min (RCF-min 280 g, RCF-clot 349 g, and RCF-max at 559 g). In response to the comments made by these authors, it is imperative that both these studies be carefully reviewed to avoid further confusion and kindly ask that future work citing these original L-PRF protocols be transcribed with a higher degree of scientific accuracy in the future. Furthermore, both these studies reported g-forces at the RCF-min and not at the RCF-clot or the RCF-max. In fact, numerous articles have miscalculated g-forces and/or time over the years, and it is imperative that this information be communicated to the reader to better characterize and report RCF values in future studies related to PRF. 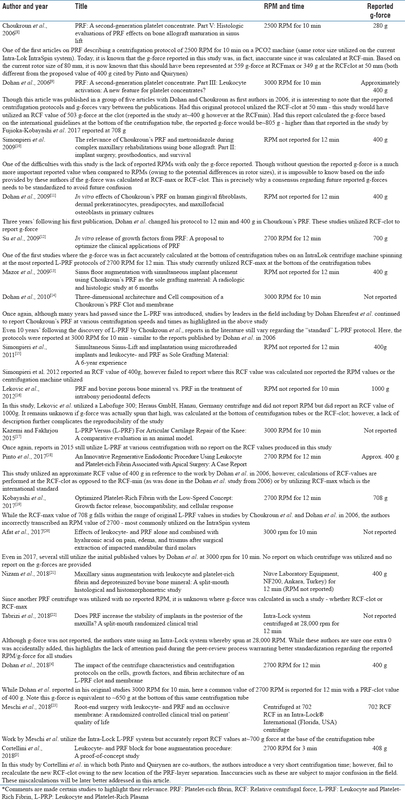 [Table 2] lists a number of studies reporting the g-forces and times over the years investigating L-PRF. These studies which are referenced since 2006 by Choukroun et al. are the focus of initial studies aimed at removing anticoagulants from blood concentrates. Unfortunately, a misrepresentation of the centrifugal g-forces is common in a number of these studies as pointed out in [Table 2]. Reports from the literature have shown that the majority of these initial studies which utilize the PC-O2 centrifuge (originally process for PRF, France, now IntraSpin by Intralock, USA) have commonly reported either inaccurate g-forces or RPM values over the years. [Table 2] further demonstrates that numerous reports utilizing the same centrifugation system with the same settings (time and RPM) have also commonly reported different centrifugation g-forces (without mentioned if the g-force values are being calculated at the RCF-min, RCF-clot, or RCF-max), creating much confusion in the literature. Many studies have since re-transcribed these inaccurate values (with little knowledge on the accurate means to report g-force) which have not only led to confusion, but also difficulty in effectively advancing the field. Our understanding today regarding the effects of centrifugation g-force on PRF-based matrices has greatly been enhanced with improvements made utilizing the low-speed centrifugation concept (LSCC). Nevertheless, we believe that today a consensus must be reached to effectively report g-force values in future studies in an accurate and scientific manner and further advance the field. The articles cited by Pinto and Quirynen describing the initial g-forces being valued at 400 g (Dohan et al. 2006, Choukroun et al. 2006) were in fact not utilizing and/or reporting either of these values neither at the RCF-clot nor the RCF-max. Several authors are correct in their calculations describing the effects of g-force based on rotor radius and effectively report RCF-min, RCFave, RCF-max, and RCF-clot. However, these authors deviate from reporting g-forces in their studies based on international centrifugation standards that effectively report g-force at the bottom of centrifugation tubes. While we certainly agree that the g-force applied to the PRF clot are different from RCF-max, below we highlight how reports from from these methods not only deviates from standard reports in the field but is subject to inaccuracies leading to future confusion in the field. These articles all report the g-force at the bottom of centrifugation tubes based on international centrifugation guidelines and not at the clot since there are inherited errors with reporting RCF-clot. To illustrate the issue with reporting g-force at the radius where the RCF-clot is located, [Figure 4] demonstrates the effect of time on the position of PRF clots formed following spin cycles of 3 min, 6 min, 9 min, and 12 min at 2400 RPM (708 g-at the RCF-max-on a Duo Centrifuge, Process). Notice how though centrifugation was carried out at exactly the same speed, the position at which the clot is located is pushed downwards owing to the longer centrifugation cycle. Since RCF-clot utilizes the radius where the clot is located, g-force must then be reported differently. When g-force is calculated based on international guidelines at the bottom of the centrifugation tubes (110 mm), 708 g is utilized in all cases irrespective of the centrifugation time. This is most representative granted that all clots were created at the same centrifugation speed using the same machine and tubes. [Figure 5] illustrates this concept further. Based on the method of calculating RCF at the clot (RCF-clot ), even though RPMs remains unchanged, owing to an increase in centrifugation time, the PRF clot is displayed downward within the centrifugation tube affecting the radius at which the centrifugation g-force is calculated. This highlights the fact that though centrifugation is carried out at the exact same speed in RPMs (2400 RPM), the RCF-clot, in fact, varies based on centrifugation time (from 425–515 g). Owing to this discrepancy, international guidelines to report g-forces on a centrifugation system have been reported at the bottom of the centrifugation tubes to best report g-forces more accurately. We would also like to further point to two recent articles published by Pinto and Quirynen and Cortellini et al. that has further created additional confusion utilizing RCF-clot as a means to represent g-force., On a standard L-PRF clot produced with an IntraSpin device, the authors report that the clot is located at approximately a 50 mm radius (subject to variation). Nevertheless, based on their calculations, this reported g-force equates to a 408 g-force at the clot (reported as RCF-clot). 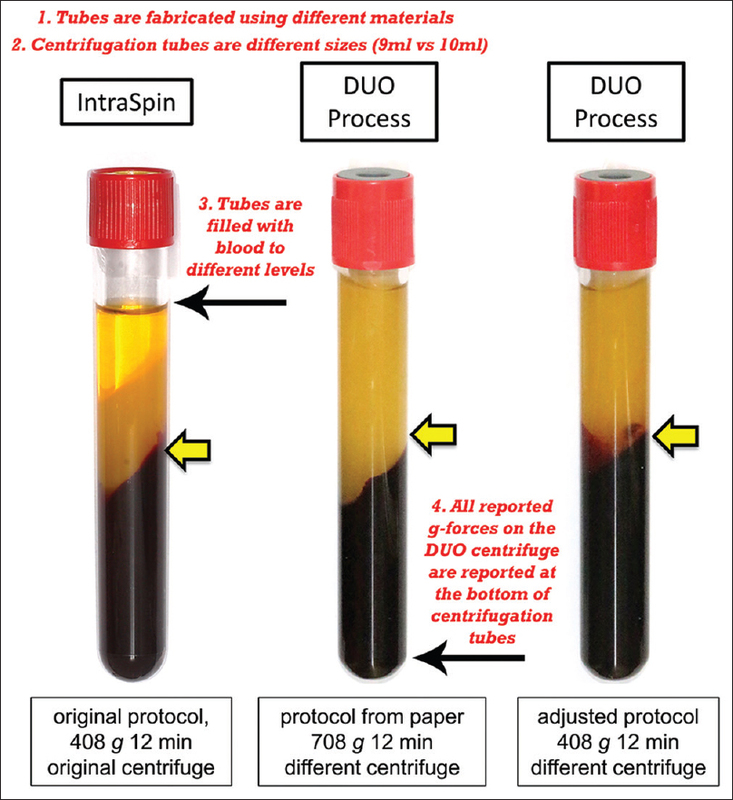 [Figure 6] illustrates the separation of layers at 2700 RPM when a 3 min protocol centrifuged is utilized on the IntraSpin centrifuge versus one that is centrifuged for 12 min. Notice the drastic difference in locations of the clots/separation layers based on this reported shorter centrifugation period. The study by Cortellini et al. 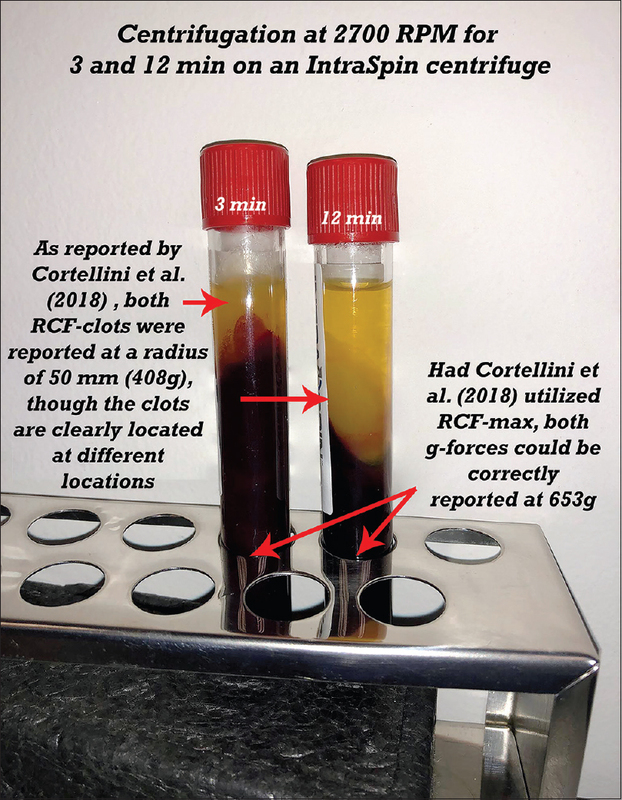 inaccurately reported a g-force of 408 g at the RCF-clot with the assumption that after 3 min, the location of the clot would be precisely the same (50 mm from the radius) as the location of the clot produced after a 12 min centrifugation period as the authors have reported in previous studies. As can clearly be observed in [Figure 6], these clots are nowhere near located at the same placement within the tubes owing to the reduction in centrifugation time (not speed). Had the authors used the RCF-max to report their data based on international centrifugation standards/guidelines, whether they centrifuged for 2700 for 3 min or 12 min, RCF-max would always be precisely reported at 653 g in either scenario. Owing to the different locations of the RCF-clot, the authors should have reported a different g-force based on their clot no longer being located at a 50 mm radius. Instead, the authors assumed/utilized the same g-force equivalent to the clot location after a 12-minute spin cycle. This is not simply a miscalculation in their study but more importantly the limitation with reporting RCF values at the clot. For these reasons, it is imperative that the scientific community be well informed of these limitations of reporting g-force values at RCF-clot to avoid future error in studies investigating platelet concentrations. At the very least, reporting exactly where the RCF values are being derived is a must. Furthermore, it should also be noted that the location of the PRF clot may vary rather significantly from patient to patient depending on individual hematocrit levels of that patient. For these reasons, it is most logical that the standard method to report g-force in a consistent manner is to report g-force at the bottom of the centrifugation tubes. Although we do agree that the g-force which is applied to the clot may vary depending on the angulation of tubes and rotor size, reporting g-force at the bottom of the tubes represents a more standardized and effective way to report g-force and one in which is subject to NO variation. Nevertheless, at the bare minimum, we insist that g-force calculations be provided when authors wish to deviate from these standard methods. Centrifugation rotors are angled differently. To specifically investigate the effects of centrifugation time and speed (g-force) on PRF-based matrices, it is logical and most scientifically accurate to minimize these number of variables. For these reasons, the study by Fujioka-Kobayashi et al. utilized one centrifugation machine with one sized rotor at the same angulation utilizing the same tubes filled to the same levels for all procedures. Naturally, the entire clot is harvested and utilized. As the entire PRF clot was utilized for each experimental group – with the L-PRF clots being slightly larger owing to the higher g-forces utilized (708 g as reported at the base of the PRF centrifuge and not at the clot). As shown in [Table 1], the g-force utilized to report L-PRF has ranged quite significantly even in original studies first published by Choukroun et al. in 2006 (RCF-max = 559 g, 2500 RPM for 10 min) to Dohan et al. 2006 (RCF-max 805 g, 3000 RPM for 10 min). The RCF-max, we have chosen in our study, corresponds to a g-force within this range of original studies (centrifuged at 2400 RPM-not 2700 RPM-which corresponds to an RCF-max value of 708 g). The use of L-PRF in our study represents a centrifugation protocol that is based on high centrifugation speeds and times that were based on original protocols developed by Choukroun et al. which fit perfectly within the ranges of these original studies. The issue raised from the letter by Pinto and Quirynen is that these authors assumed that these original articles calculated RCF values at the RCF-clot (which is not the case) or that the study by Fujioka-Kobayashi et al. calculated g-force at RCF-clot (which is also not the case). This is why today we believe that all g-forces and RCF-values should be clearly reported at the RCF-max in future studies to avoid future confusion in the field and to improve scientific accuracy in future publications. As the science has drastically evolved over the years and our understanding concerning the effects of PRF-based protocols have been optimized more recently, the effects of lowering centrifugation speed and time have more favorably shown that a reduction in g-force (RCF values can be calculated at RCF-min, RCF-clot or RCF-max) has led to clots that contain higher cellular content and growth factor release owing to the LSCC [Figure 3].,,,,,,, The article published in the Journal of Periodontology by Fujioka-Kobayashi et al. highlights how a reduction in not only centrifugation speed but also in time led to increased growth factor release and also improved cellular behavior further adding to the available literature supporting the LSCC. To investigate the effects of centrifugation speed or time on PRF-based matrices, researchers in the field are encouraged to design experimental protocols that utilize precisely the same machine, with the same rotor sizes, utilizing the same tubes, to minimize unnecessary additional parameters into their study. Comparative studies whereby centrifugation machines are compared, with different centrifugation speeds, radiuses, angulations, with different tubes and even different spin cycles and times are not ideal to report scientifically the effects of relative g-force or time since too many variables are introduced into these studies. When evaluating and definitively when comparing medical devices and protocols in this arena, factual accuracy is of utmost importance. We, therefore, ask kindly that authors working in the field re-evaluate the articles published by Choukroun et al. and Dohan et al. in 2006 having reported initial g-forces of ~400 g. We show within this article that neither of these original studies have utilized the proposed centrifugation g-force reported in recent papers – neither at RCF-clot or RCF-max (one reported at 280–2500 rpm for 10 min, the other at 3000RPM for 10 min). We also ask kindly that all authors working in the PRF or PRP field reconsider reporting their g-forces at the bottom of centrifugation tubes since the use of RCF-clot for reporting g-forces both deviates from international standards but more importantly introduces new variability and error in reported values [Figure 5]. Authors that wish to investigate the effects of centrifugation speed or time in future publications should also utilize an appropriate experimental protocol. Such studies should ideally be designed using the same centrifugation machine, at the same centrifugation radius, with the same tube angulations, fabricated of the same composition, filled with blood to the same levels and utilizing the same centrifugation tubes. In the future, we sincerely hope this article provides the basis for more accurate scientific documentation/publication of PRF studies moving forward, and we sincerely hope a consensus be reached, and a stricter peer-review process be warranted regarding the report of g-force values in future scientific publications related to PRF. Disclosure: Richard Miron and Shahram Ghanaati report no conflict of interest in relation to any centrifuge or related devices. Joseph Choukroun is the owner of PRF for Process and a research fellow of the FORM-lab, in which objective and independent research and non-product-name-based research such as the invention of LSCC (low speed centrifugation concept) has been performed. Richard Miron is an independent researcher. All PRF-related work from Miron's lab and FORM-lab and their associates have been performed aiming to use reproducible equipment for data acquisition, which enable to generate objective and transparent research, in order to better understand the regenerative potential of PRF. Choukroun J, Adda F, Schoeffler C, Vervelle A. Platelet Rich Fibrin: An opportunity in perio-implantology. Implantodontie 2001. Castro AB, Meschi N, Temmerman A, Pinto N, Lambrechts P, Teughels W, et al. Regenerative potential of leucocyte- and platelet-rich fibrin. Part A: Intra-bony defects, furcation defects and periodontal plastic surgery. A systematic review and meta-analysis. J Clin Periodontol 2017;44:67-82. Cortellini S, Castro AB, Temmerman A, Van Dessel J, Pinto N, Jacobs R, et al. Leucocyte- and platelet-rich fibrin block for bone augmentation procedure: A proof-of-concept study. J Clin Periodontol 2018;45:624-34. Pinto NR, Ubilla M, Zamora Y, Del Rio V, Dohan Ehrenfest DM, Quirynen M, et al. Leucocyte- and platelet-rich fibrin (L-PRF) as a regenerative medicine strategy for the treatment of refractory leg ulcers: A prospective cohort study. Platelets 2018;29:468-75. Beck DJ, Bibby BG. A centrifugal technique of measuring food retention. J Dent Res 1961;40:148-60. Pinto N, Quirynen M. Letter to the editor regarding fujioka-kobayashi et al. 2017 (JOP-16-0443.R1). J Periodontol 2018. Doi: 10.1002/JPER.18-0175. [Epub ahead of print]. Dohan Ehrenfest DM, Diss A, Odin G, Doglioli P, Hippolyte MP, Charrier JB, et al. In vitro effects of choukroun's PRF (platelet-rich fibrin) on human gingival fibroblasts, dermal prekeratinocytes, preadipocytes, and maxillofacial osteoblasts in primary cultures. Oral Surg Oral Med Oral Pathol Oral Radiol Endod 2009;108:341-52. Kazemi, D. and A. Fakhrjou, Leukocyte and Platelet Rich Plasma (L-PRP) Versus Leukocyte and Platelet Rich Fibrin (L-PRF) For Articular Cartilage Repair of the Knee: A Comparative Evaluation in an Animal Model. Iran Red Crescent Med J 2015;17:e19594. Pinto N, Harnish A, Cabrera C, Andrade C, Druttman T, Brizuela C. An Innovative Regenerative Endodontic Procedure Using Leukocyte and Platelet-rich Fibrin Associated with Apical Surgery: A Case Report. J Endod 2017;43:1828-34. Doi: 10.1016/j.joen.2017.07.002. Fujioka-Kobayashi M, Miron RJ, Hernandez M, Kandalam U, Zhang Y, Choukroun J, et al. Optimized platelet-rich fibrin with the low-speed concept: Growth factor release, biocompatibility, and cellular response. J Periodontol 2017;88:112-21. Afat İM, Akdoğan ET, Gönül O. Effects of leukocyte- and platelet-rich fibrin alone and combined with hyaluronic acid on pain, edema, and trismus after surgical extraction of impacted mandibular third molars. J Oral Maxillofac Surg 2018;76:926-32. Nizam N, Eren G, Akcalı A, Donos N. Maxillary sinus augmentation with leukocyte and platelet-rich fibrin and deproteinized bovine bone mineral: A split-mouth histological and histomorphometric study. Clin Oral Implants Res 2018;29:67-75. Tabrizi R, Arabion H, Karagah T. Does platelet-rich fibrin increase the stability of implants in the posterior of the maxilla? A split-mouth randomized clinical trial. Int J Oral Maxillofac Surg 2018;47:672-5. Meschi N, Fieuws S, Vanhoenacker A, Strijbos O, Van der Veken D, Politis C, et al. Root-end surgery with leucocyte- and platelet-rich fibrin and an occlusive membrane: A randomized controlled clinical trial on patients' quality of life. Clin Oral Investig 2018;22:2401-11. Dohle E, El Bagdadi K, Sader R, Choukroun J, James Kirkpatrick C, Ghanaati S, et al. Platelet-rich fibrin-based matrices to improve angiogenesis in an in vitro co-culture model for bone tissue engineering. J Tissue Eng Regen Med 2018;12:598-610. El Bagdadi K, Kubesch A, Yu X, Al-Maawi S, Orlowska A, Dias A, et al. 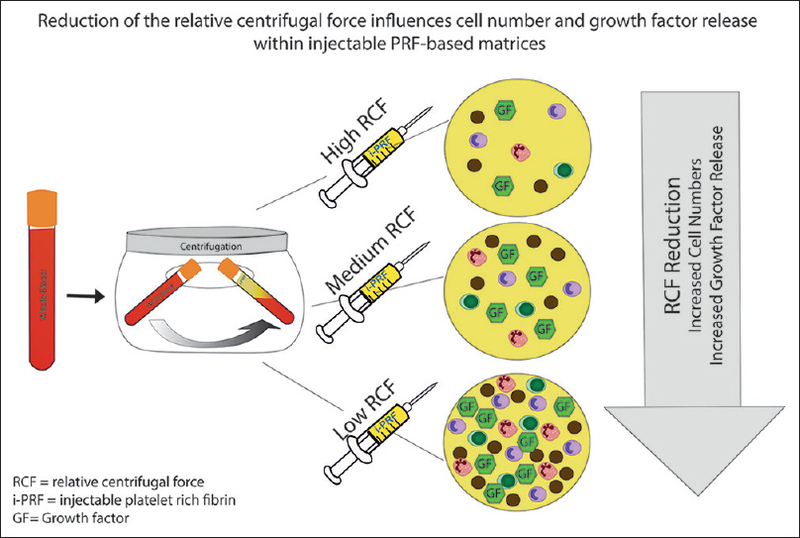 Reduction of relative centrifugal forces increases growth factor release within solid platelet-rich-fibrin (PRF)-based matrices: A proof of concept of LSCC (low speed centrifugation concept). Eur J Trauma Eur J Trauma Emerg Surg. 2017. Doi: 10.1007/s00068-017-0785-7. [Epub ahead of print]. Kubesch A, Barbeck M, Al-Maawi S, Orlowska A, Booms PF, Sader RA, et al. 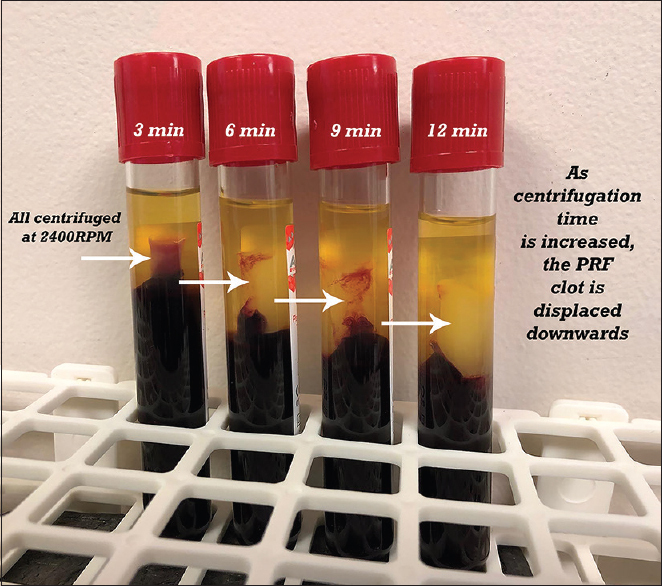 A low-speed centrifugation concept leads to cell accumulation and vascularization of solid platelet-rich fibrin: An experimental study in vivo. Platelets. 2018:1-12. Doi: 10.1080/09537104.2018.1445835. [Epub ahead of print]. Cabaro S, D'Esposito V, Gasparro R, Borriello F, Granata F, Mosca G, et al. White cell and platelet content affects the release of bioactive factors in different blood-derived scaffolds. Platelets 2018;29:463-7.